Our exploration of Corner Bar takes us to the heart of the solar system. Energy crackles, fusion unleashes, galaxies are born and destroyed. A futuristic guitar unlocks the gateway and releases the possibilities the future holds. The man with the keys will be our guide through the quantum wilderness. The drummer will push and pull us across the spectrum of the fourth dimension. Adventure awaits those who cross the threshold. Make sure your friends and neighbors do not miss the unique opportunity presented this first friday. A tale to be remembered for the ages. Your guides into the mist are Joe Doria (keys), Ari Joshua (guitar), and Brad Gibson (drums). Watch, listen, as they harness the forces of the universe. Believe! All are welcome. Refreshments and sustenance are available for purchase. Entrance to the cosmos is free! Celebrating our Centennial by the decade! The next installment brings the 40s (1939 – 1948) into the picture, so dress accordingly, come in character, take photos in our booth, and stop in to check out our amazing new installment of the HPIC Banners that will be on display at each Corner Bar, thanks to our amazing volunteers – Dina Johnson, Kay Kirkpatrick, Julie Schickling, and other special contributors – that have put so much effort into documenting our history in such an amazing way. Celebrating our Centennial by the decade! 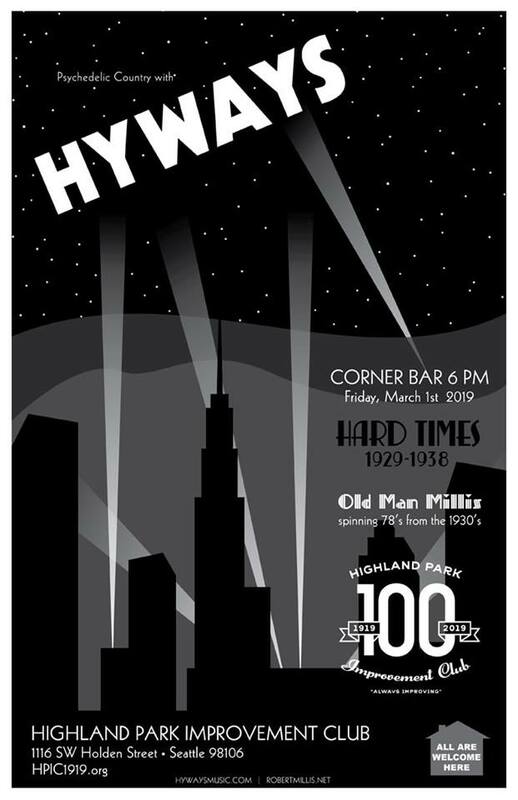 The next installment brings the 30s into the picture. We have a combination of fabulous talents providing the soundtrack to another Corner Bar. Old Man Millis will spin shellac from years of old. Presenting the sounds that began to creep into the general collective experience. HYWAYS will ride the road that was paved in the countryside, through the farmlands, and out to the west. Their country visions provide the soundtrack and push us along the landscape that is recalled from the not so distant past. Help us gather with our neighbors and friends in pushing on through the hard times in order to come out on the other side. Reborn and refreshed. 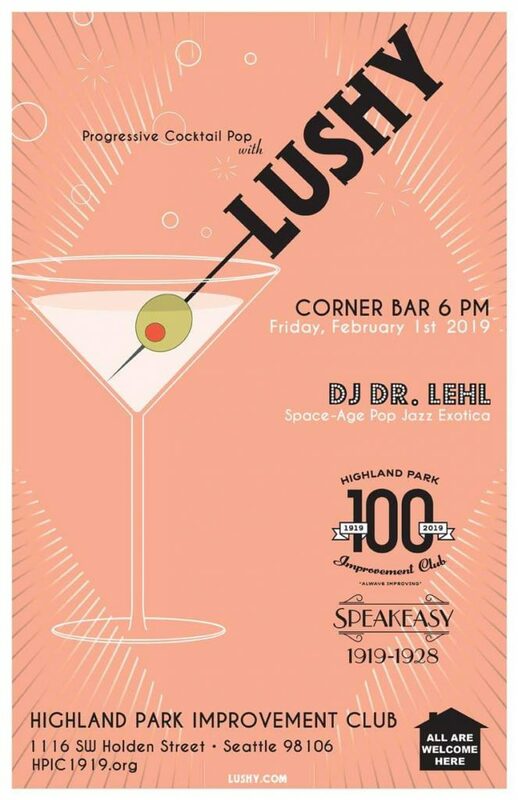 Get warm with Lushy at our 1920’s speakeasy – celebrating HPIC’s 100 years through the decades, starting with 1919. You are invited to a community screening of the feature length documentary film CRAZYWISE, directed by Phil Borges and Kevin Tomlinson. Back in the US, Phil follows two young Americans diagnosed with “mental illness.” Adam, 27, suffers devastating side effects from medications before embracing meditation. Ekhaya, 32, survives several suicide attempts before spiritual training to become a traditional South African healer. CRAZYWISE introduces mental health professionals and psychiatric survivors who see a psychological crisis as a potential growth experience, not a disease. Annual NYE Party! Prom Theme! Everyone Welcome! Bring your families, bring your neighbors! We hope to spend another magical evening with you all ringing in the New Year! Free entry – all ages. 11:59pm – Countdown to 2019! Join us as we kick-off HPIC’s Centennial Celebrations! Corner Bar – Friday, April 7 – doors open at 6pm. All ages. 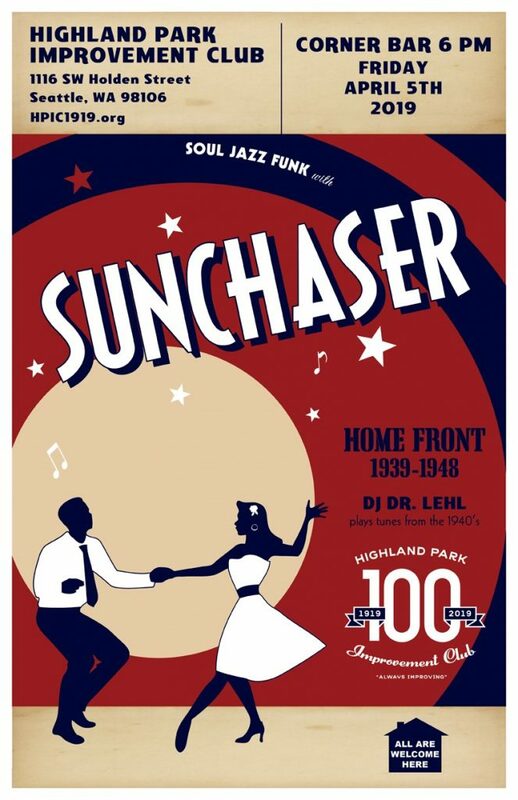 Catch a wave with DJ Dr Lehl until the band starts, and after band sets. Beverages Draft beer, wine, and HPIC Classic Cocktails! As always, we offer a wide assortment of non-alcoholic beverages as well. Please remember that no outside alcohol is allowed. Corner Bar is growing up and we want to hire a few bartenders! Corner Bar is about to turn 5 years old! To date, it has been completely staffed by our hard-working, dedicated, passionate volunteers. That’s around 1500 hours of our volunteers’ love, sweat, and cocktails in bartending time alone! Not to mention the countless additional hours spent to make Corner Bar happen each month – coordinating the food, cocktails, kegs, band, inventory, shopping, prepping, setup/cleanup, etc. It’s a big effort. It’s also a great reward for us. We love our neighbors. The time has come for our volunteers to enjoy Corner Bar from the other side of the bar – with a beverage in hand – and I think we can all agree they’ve earned it. So we’re hiring a couple of bartenders to help run the bar! If you are interested in serving the community, meeting new people, and want to be a part of ensuring Corner Bar continues to be a success for years to come, we want you to join our team! We’re looking for 1-2 more bartenders to add to our team. You must have a valid MAST permit. Pay is $15/hour + tips, and the primary shift we need help with is 5PM to 12AM on the first Friday of every month. We are also working on exciting new events to bring to the club that will provide more opportunities to tend bar at HPIC. If interested, please contact Nicole Mazza at hpic1919@gmail.com! Cheers! It’s fun, we promise. Doors open at 6:00 pm with a children’s short at 6:15 and the main movie at 7. Free admission. Volunteers will be selling popcorn, candy, and other movie fare. Bring blankets and pillows or sit in our chairs. This is an all ages event. Bring your friends, family and neighbors. Short movie hint: Space-age fun with George and Jane and Judy and Elroy and don’t forget Astro! Feature movie hint: 2005 G (1 hr 25 minutes). In this British stop-motion animated comedy, a man and his loyal dog set out to discover the garden sabotage that plagues their village and threatens the annual giant vegetable growing contest. Here’s your heads-up! Register here. your imagination free. Let creativity and spirits flow freely @ HPIC. Join us at the HPIC art lounge! Class: Bottles & Brushes (Paint the Seattle skyline!) Register. Bring your yarn, sketchpad, paint & canvas, adult coloring book, art project, etc!